Original work by Marty McFly, Fremantle. Revelation Film Festival is hosting a special series of screenings across November as part of the 2018 Australiyaniality Arts Festival. Australiyaniality aims to explore Australia’s wellbeing. The key word liyan is a Yawuru word that relates to Aboriginal people’s view of their wellbeing. It is about the way they feel about themselves and relationship with their community. 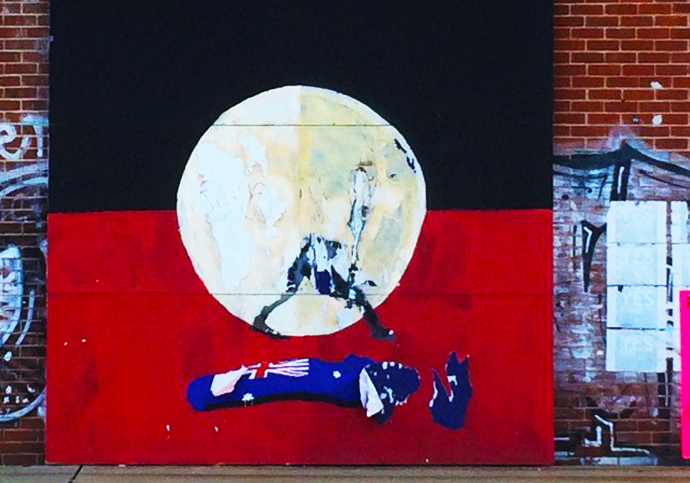 27 artists have come together from different disciplines and cultural backgrounds to interrogate their own Australian identity and explore what a better Australian Identity could look like. For this special program Rev is screening some of the best and most challenging Australian works produced in recent years at The Backlot Perth. Jandamarra’s War is the story of an aboriginal Australian man who should be as famous as Ned Kelly. In 1894, Jandamarra led a rebellion against invading pastoralists in defence of his people’s ancient land and culture. VAST follows over 30 artists who converged on the Pilbara for a week of creation, recording and collaboration.